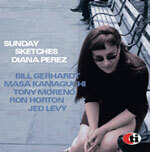 Jazz vocalist Perez (first name Diana) offers a sampling on her third album, It's Happenin' . The instrumental portion of this album is really topflight jazz, but vocally the first half is pleasant at best, finding some inspiration about halfway through the session. Perez is a child of Cuban Irish and Puerto Rican heritage and claims musical expertise going back to age four. She graduated from New York's High School of Art and Design, leaving for Los Angeles at the age of 17 to work in the art and design world. Her interest in jazz began at that time, with emphasis on jazz vocalists. Relocating to Amsterdam, Perez became a regular at the Bimhuis, returning to New York after ten years and two albums on Timeless Jazz. The assembled musicians, led by pianist/arranger David Hazeltine, are outstanding, including trombonist Steve Davis; trumpeter Ron Horton, tenor saxophonist/flautist Jed Levy, bassist Nat Reeves and drummer Joe Farnsworth. Perez begins promisingly on a hip vocal version of Herbie Hancock's "Will You Still Be There," with lyrics by Anita Wardell, one of the singer's California musical pals. However, she seems to lock into lethargic balladry on the standardsHayman/Levant's "Blame It On My Youth" Mann and Hilliard's "In the Wee Small Hours" and Jobim's classic "Corcovado," despite some fine solo work from Horton, Levy and Hazeltine. Things do come alive, however, on a vocal version of Art Farmer's "Farmer's Market," with the Annie Ross' lyrics. Levy plays the melody on flute in unison with Perez's vocals, adding a bit of 1950s panache. A most expressive ballad take on Carter/Ellis/Frigo's "Detour Ahead" follows, which Perez reports she first heard on the Bill Evans Sunday at the Village Vanguard (Riverside/OJC, 1961), and is one of the better versions heard, featuring more of Levy's flute work. A swinging version of Miles Davis' "Milestones," featuring the lyrics of Connecticut's Giacomo Gates, is another highlight. Trombonist Davis and Levy on tenor sax (his main axe) offer sparking solos. Another ballad, Eden Abbez's "Nature Boy," remains average. Perez and company conclude with a swinging take on Juan Tizol's "Perdido," with all hands cooking and the singer giving a game try at some vocalese which, after the break and in unison with the horn, provides a good finish. Track Listing: Will You Still Be There; Blame It On My Youth; Corcovado; In The Wee Small Hours; Farmers Market; Detour Ahead; Milestones; Nature Boy; Perdido. Personnel: Diana Perez: vocals; David Hazeltine: piano; Joe Farnsworth: drums; Nat Reeves: bass; Steve Davis: trombone; Ron Horton: trumpet; Jed Levy: tenor sax, flute.